LEFT: Most Silversea passengers can afford to dress well, but not all are this glamorous or good-looking. Your favorite movies are Merchant-Ivory films, which you watch for decorating ideas. Your favorite movie is Animal House, which you watch for party ideas. You adore Cole Porter. You prefer Smashing Pumpkins. You wear a tuxedo as a guest at charity events. You wear a tuxedo as a bartender at charity events. You shop for Bvlgari jewelry at expensive boutiques. You don't know how to pronounce "Bvlgari," or you think it's a type of wheat at the organic food co-op. You enjoy caviar wherever you can find it. You enjoy canned tuna whenever you can afford it. Your cousin was arrested for insider trading. Your cousin was arrested for petty theft. Silversea is billed as a "six-star" cruise line, and it caters to travelers who value quality and comfort over price. Silversea's fares are all-inclusive. When comparing Silversea's fares with those of other luxury cruise lines--or with the cost of land-based travel, for that matter--you should calculate what you'd pay elsewhere for beverages and tips. Like many cruise lines, Silversea offers discounts for early booking and advance payment. Discounts vary by itinerary; in Europe, the maximum is usually 10% to 20%, or 25% on transatlantic sailings. Silversea also offers capacity-controlled "Silver Sailings" discounts on some voyages that can be as high as 50%. After your first cruise, you're entitled to "Venetian Society" discounts on many voyages. You can combine these with early-booking and advance-payment discounts. The total discount can be as high as 25% on selected European cruises, or 30% on transatlantic voyages. 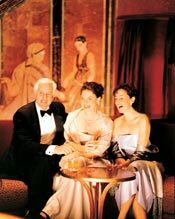 Silversea also has a refer-a-friend program for Venetian Society members. If you talk your next-door neighbors into cruising on Silversea, you'll get a 5% credit toward a future cruise and your friends will get a discount of $500 per person. That won't help you now, but it could save you money in the future. Bottom line: A Silversea cruise is expensive, but it can be a good value if you're a well-heeled traveler who's used to paying for luxury hotels, restaurants, and transportation--or yacht charters, if you're the type of person who can afford Silversea's highest-priced suites.